August 2003: The summer of 2003 saw British Columbia and Alberta ravaged by forest fires. Of the Rocky Mountain parks, Kootenay was the worst hit. 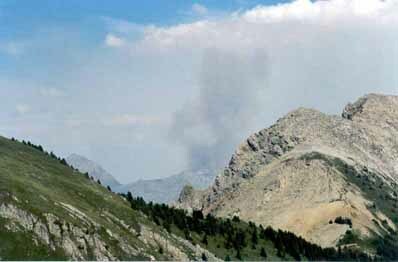 On this occasion, hikers saw a new plume of black smoke erupt while they were on the Kindersley-Sincla ir Col. It transpired that this fire had closed the Banff-Radium highway, and together with other fires had caused the temporary closure of most of the trails in the park.